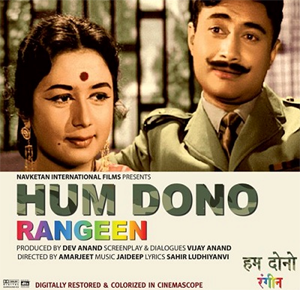 A teenaged girl who came escorting her grandparents and four middle-aged couples were the only viewers at one of Delhi's downtown multiplex theatres for a screening of "Hum Dono Rangeen", the newly released coloured and high-tech version of the 1961 black and white classic. Being among the nostalgic 11, one felt really good about re-visiting a film seen as a teenager five decades ago. The theatre staff consolingly said the hall was full over the previous weekend and hoped it would again be so, provided the movie ran into a second week. But there was a lingering sense of disappointment about the obvious preference for fast paced, loud storytelling, with Westernised music and up-front overtones that appear to keep the current crop of teenagers and the young away from this movie. The mixed audience response sends a clear message - each generation has its own set of values. Brushing aside these concerns, it is however perfectly possible to enjoy the new version with a slightly altered name. That Dev Anand, the producer-actor who carried the film to glory on his slender shoulders, is very much around to promote it in his very special way does matter. It helps relate with the movie better. Dev Anand, who is making films at 88, opens the new film with a very brief commentary, in black and white to begin with and slowly turns to colour as he extols the Cinemascope, the Dolby sound system and other technological value additions. But the content remains the same. The emotion-charged situations in a story by Nirmal Sircar, ably written by the late Vijay Anand who went on to make more successful films like "Tere Mere Sapne" and "Teesri Manzil". The piece de resistance is the lilting Hindustani classical-based music by then debutant Jaidev who composed iconic songs. If "Main zindagi ka saath nibhata chala gaya" underlines Dev Anand's philosophy of life that he advocates for everyone, two of Indian cinema's best 'bhakti' (devotional) songs - "Allah tero naam" and "Prabhu tero naam" - also make it a memorable experience. Sung by Lata Mangeshkar they defy attitudinal and technological changes that occur with each passing generation. The movie has Dev Anand in a double role, playing two army officers, quite different in their age, mannerisms, but basically humane, who get emotional while serving on the war front. Their emotions may seem too gushing in today's cynical world, but their hold on the audience remains undiluted even now. Dev is ably complemented by Sadhna, the rich girl in love with the younger version of the star, and Nanda, married to the elder one. The deep understanding and the sense of sacrifice these women display despite education and urban living are a tribute to the eternal Indian woman. Set against the backdrop of World War II, more specifically, the Burma front, the film strikes the right chord by stirring universal emotions of love, patriotism, sacrifice and dedication. Director Amarjeet was nominated for the Golden Bear at the 1962 Berlin International Film Festival. For Dev Anand, playing the romantic Anand remained his forte for much of his acting career. But the older generation relished his role as Mahesh, the moustachio-ed army major. It was the more celebrated of the two performances. Today, the cocky Major would seem somewhat unnatural. His put-on accent is neither Col. Blimp's, nor Brown Sahib's. It is just Dev Anand's - at places overdone. Both the characters Dev Anand plays are smokers. Indeed, the cigarette lighter with a lilting tune that Sadhna presents to his beau keeps appearing and chiming from beginning to end. These are musical moments. Today's Hindi cinema audiences are used to watching films lasting about two hours, so "Hum Dono Rangeen" could be a test of patience. There are long drawn scenes and extra long pauses that contribute in a major way to this three-hour long affair. Perhaps, "Rangeen" could have been released as a snappier version, no more than 150 minutes, and could have attracted larger audiences.